Goldman Environmental Prize winner Munkhbayar, who in January 2014 was sentenced to almost 22 years in jail, as well as four of his friends from the Gal Undesten Movement, won significant reductions in their sentences in the City Court of Ulan Baatar. They were protecting the law prohibiting mining in sensitive areas from being abolished. See THE SHORT HISTORY OF THE LAW WITH LONG NAME. Goldman Environmental Prize winner of 2014 Suren Gazaryan believes that the Munkhbayar’s case demonstrates wider tendency of increased persecution of environmental activists. 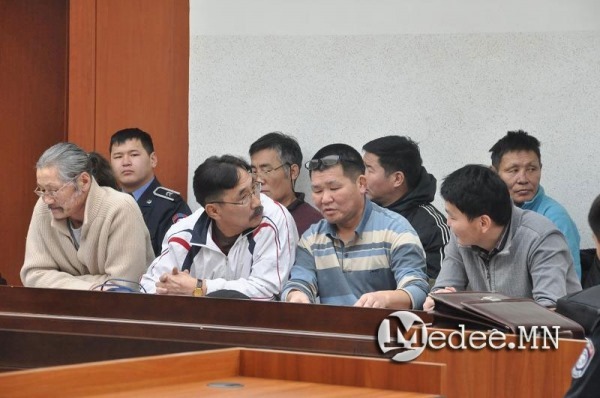 At the first District-level trial in January 2914, the movement leaders Ts.Munkhbayar, G.Boldbaatar, D.Tumurbaatar and J.Ganbold, who had been imprisoned for 6 months already, were found guilty and each received sentences of an additional 21 years and 6 months, while Munkhbold, a person who supplied arms, received a 2-year sentence. Other protestors O.Sambuu-Yondon and B.Gantulga were found innocent. Cumulatively, the activists’ sentences add up to 90 years in prison for environmental protesting – in what appears to be a world record of injustice. 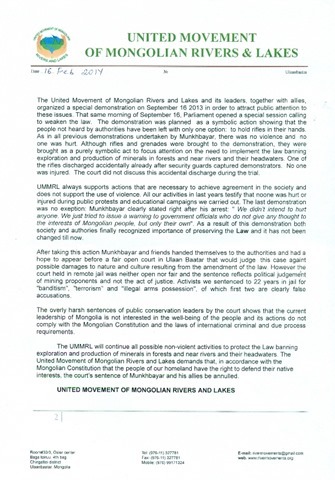 Leading Mongolian lawyers discredit the sentence given to Munkhbayar. 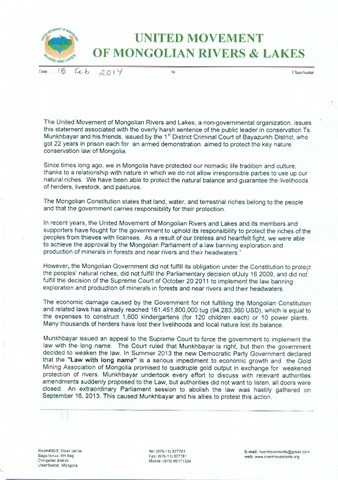 Mongolian society and organizations throughout the world were absolutely stunned by this cruel decision and many organizations and networks such as Earthworks, Rivers without Boundaries Coalition, and the Goldman Environmental Foundation demanded justice for the activists. 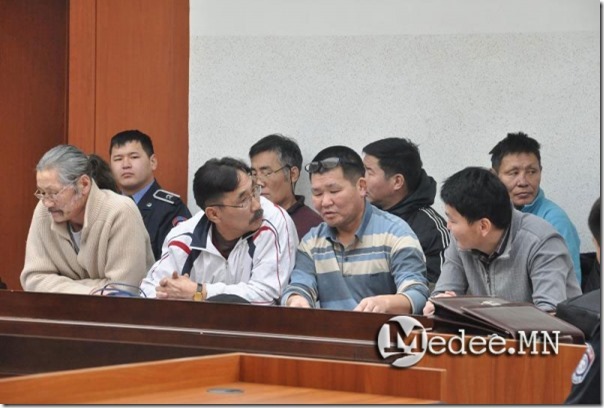 Moreover, in advance of the appellate proceedings, on April 1, the activists’ relatives promised to hold a hunger strike on the steps of Supreme Court of Mongolia if the unjust sentences were not reversed. At the April appellate trial, the jury decided to reduce the terms of imprisonment for each protestor. 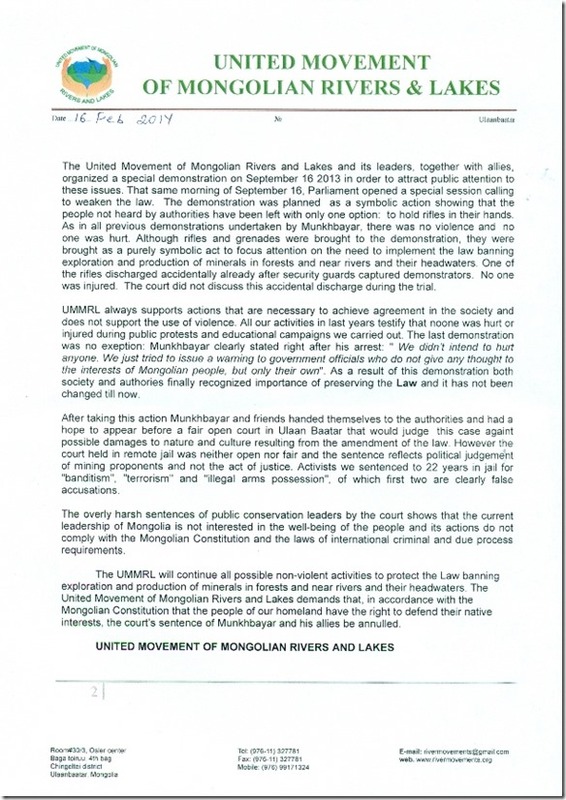 Ts.Munkhbayar’s sentence was reduced to 7 years, G.Boldbaatar’s to 6 years and 1 month, D.Tumurbaatar’s to 10 years and 6 months, J.Ganbold’s to 1 year, and M.Munkhbold’s to 1 year. The findings that the other two protestors (O.Sambuu-Yondon and B.Gantulga) were innocent remained unchanged. Thus, the cumulative sentences now amount to 25 years in jail. 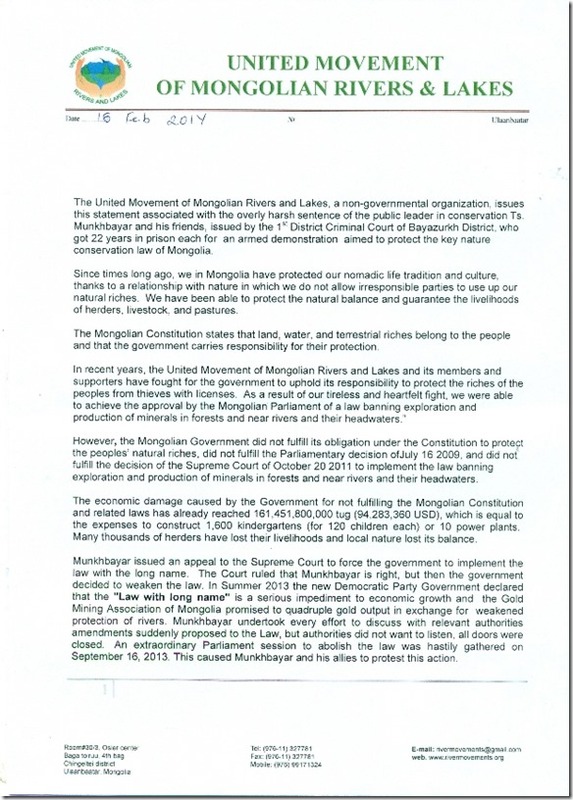 The activists still have the right to appeal to the Supreme Court of Mongolia. The appellate court’s three-fold reduction in the activists’ terms of imprisonment demonstrates the gross injustice of the initial sentencing, and that the judicial authority clearly sees the political nature of this prosecution. Additionally, the appellate court acknowledged demands for a public and fair trial and permitted greater access to the proceedings. 2014 Goldman Prize winner Suren Gazaryan stresses that “Munkhbayar is not the only case of such persecution.” Several weeks ago, a friend and colleague of Gazaryan, Evgeny Vitishko, was jailed for three years on charges of severely damaging property by graffiti at the residence of Tkachov, the province’s governor. “We have to undertake preventative measures to be able to achieve sustainable support for groups in the region,” Gazaryan said.